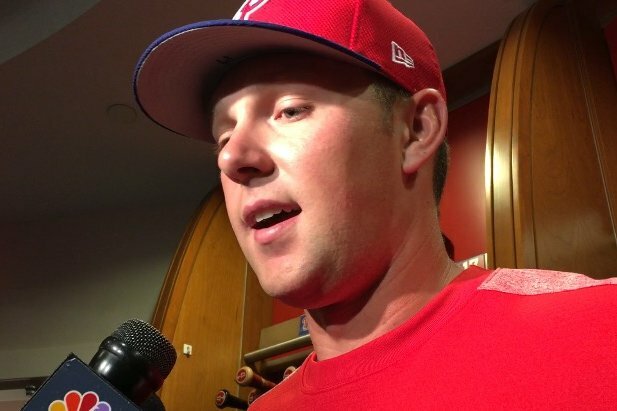 Rhys Hoskins speaks to the media before making his major league debut with the Phillies on Thursday at Citizens Bank Park. Rhys Hoskins is currently taking pregame batting practice at Citizens Bank Park. He got word of his promotion from Triple-A Lehigh Valley last night. He'll wear No.17 and hit seventh in the Phillies lineup tonight. It's been a whirlwind of a last 24 hours for Hoskins, who began this week playing in left field in a game for the first time in more than five years. If you're looking for more Rhys Hoskins stuff, here is the news on his promotion from this morning, here is a story on the Phillies plans on playing him in left field (and also first base, too, according to Pete Mackanin) from yesterday, and here is a fun Q&A revealing a little bit about his personality from last summer. Opening up a four-game series with the Mets tonight at Citizens Bank Park.